I hope those readers who celebrate are having a nice Easter. My mom always hid our Easter baskets first thing in the morning, so my sister and I usually dug into them before breakfast. Unlike Halloween, where the candy was dessert after dinner and trick-or-treating, Easter candy was always enjoyed on an empty stomach. It took me several years to learn that when you only eat candy for breakfast and lunch, you get a nasty stomach ache. 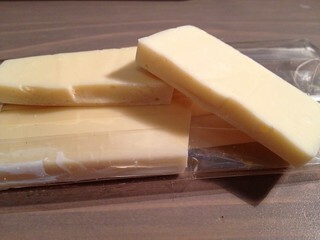 The holiday put me in the mood for white chocolate, and I just happened to have this Cocoa Ooze white chocolate bar from Aberdeenshire in Scotland. The name "Cocoa Ooze" puts a delightful image in my head, like a chocolate volcano. Though the packaging was quite elegant, there wasn't much information about the bar on the wrapper except that the chocolate was made with 28% cocoa solids. The chocolate was quite thick and broke with a satisfying snap. 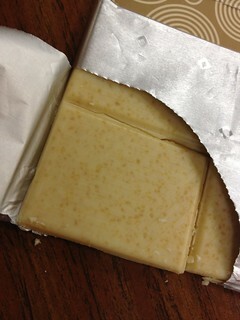 The bar smelled milky, and the white chocolate was about as good as I've had, if a little boring. The chocolate was creamy and buttery, and it melted without getting sticky or grainy. Despite being a solid hunk of white chocolate, the sweetness was perfect. It was still sweet enough to satisfy my Easter craving, but it didn't burn my throat. I am curious what was used to sweeten the bar (probably plain old sugar) but it didn't say. 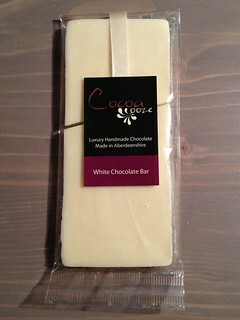 Cocoa Ooze makes a strong white chocolate bar, and even though it won't thrill you, it certainly won't disappoint. When a chocolate bar has "spicy" in the title, I usually take it with a grain of salt. My husband and I are spicy food junkies and our tolerance for heat is pretty high. So when a chocolate bar actually does have a nice kick to it, it's a very pleasant surprise. 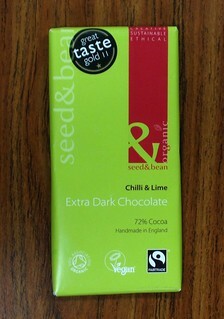 This Seed & Bean bar is another gift my boss brought back from the UK. This bar is organic, fairtrade, and vegan (though it might have traces of milk). 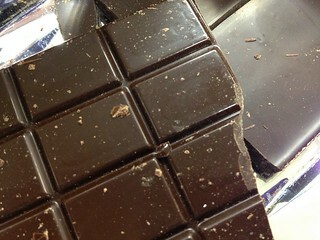 While 72% cocoa is not what I'd call "extra dark" it's right where I like my chocolate bars to be. Everyone's got a chili chocolate bar, but this is the first chili lime bar I've tried. The chocolate was glossy and quite pretty with a nice, hard snap. Right away, I could taste the crisp hint of lime, but as the chocolate melted, the chili heat began to build. This bar was pretty hot! Even after the chocolate was gone, the pleasant burn lingered for several minutes. The chocolate itself was fantastic. Despite the heat, the bar still had a nice, mildly bitter cocoa flavor. It melted so smoothly and cleanly, leaving just the heat behind. In fact, all of the flavors were very clean, with no odd pepper flavors or sour notes from the lime. If you're not a fan of hot stuff, you may want to skip this one, but it's one of the best spicy bars I've ever had! Work, grad school, and trying to have a social life have all kept me very busy, and unfortunately this blog has suffered as a result. Sorry for going missing again, but I'm going to keep trying to do it all! So, you may remember that my boss is British, and that when she goes to visit her parents in Scotland, she often brings back British chocolate to try. She brought back so much this time that I have consumed most of my calories from chocolate today, and it's just after noon. This Crème Brûlée (thank goodness for autocorrect, it saved me a lot of trouble with those accents) bar came from the large department store chain Marks & Spencer, which sells a wide range of chocolates branded with its own name. 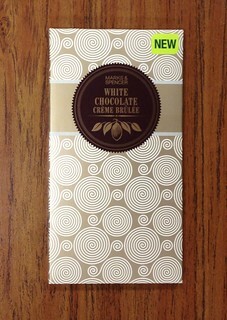 The ingredients list was quite simple, and the label said the white chocolate contained at least 21% milk solids. The speckles in the bar were quite pretty and reminded me of Easter. The chocolate smelled of vanilla and butter, almost like butterscotch. It was quite sweet, but it had a pleasant milky vanilla flavor. The little flecks turned out to be crunchy, toffee-like caramel granules that evoked the first wonderful crunch of stabbing crème brûlée with a spoon (definitely the best part of eating crème brûlée). While the bar was a little too sweet for my liking, it thankfully wasn't cloying. The crunch from the caramel granules was fun, and against the smooth and creamy melt of the chocolate, it captured the feeling of the dessert. I'm not a big fan of crème brûlée (aside from the stabby part), but this bar had some nice textures. Still, one little square at a time was enough for me.